Beautiful vases Cathy. Roses and Dahlias seem strange bedfellows but they actually look wonderful. You have a great selection of Dahlias, where do you buy them. I’ve bought from Lidl, local garden centres, a company called ‘Promesse de Fleurs’ (online) and also – inevitably – from Peter Nyssen. I have a hard time keeping them happy over the winter, but I have so many nice ones I want to try harder this year! I leave mine in the ground but I don’t think you’d get away with that in your clay soil. I did actually do that last winter, Christina, as a test. Fortunately two that I am fond of came through, although the others died. I normally take them into the ‘cave’ (wine cellar) over winter. Sometimes with compost, sometimes just dry – as a test. I think it depends how dry the winter is (ie cold – sometimes very). This year I will try a very light (not garden soil/not compost) packing around them and try to visit them more frequently. Love your roses! I am always envious of everyone’s beautiful roses as mine never seem to do very well. Certainly not anywhere near yours. They are not quite so impressive in the actual garden. I think this is a common problem – I often look with envy at other people’s rose bushes! Your flowers are excellent….this week I found your description of rural life in France very interesting. The general trend is to have centralization of services, with ‘cottage hospitals’ closing down. We find in in so many services including shopping etc…no wonder the Doctor’s are not to be found in the countryside, they want to work in large centres. Yes – death of the countryside is global, I’m afraid. I don’t really know if there’s an answer – but I do hope we work one out! Your dahlias a gorgeous and I’m swept away by the beautiful roses. Lovely presentation. I too enjoyed reading about your corner of the world. I’m sure you made a big impact on your summer students. I hope I did, but I have to say the age difference was not easy to cope with. I think the sweet 9-year-old boy (with quite good English) was often bored! 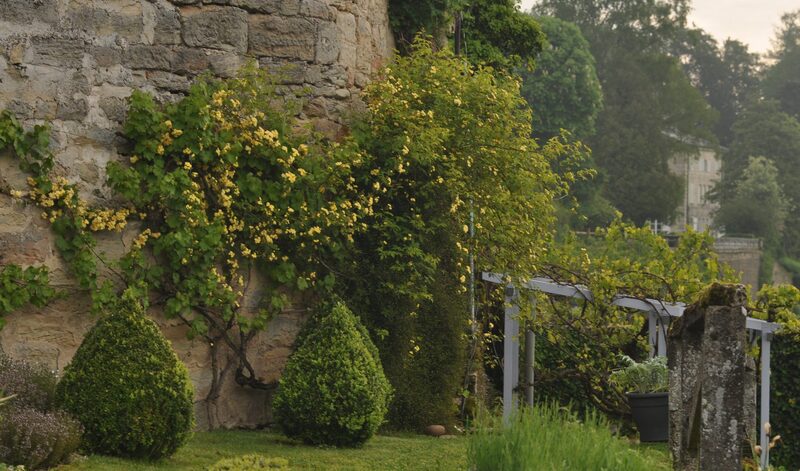 As well as enjoying your splendid roses and dahlias, I enjoyed reading about rural France. It’s much the same in rural Australia, although the town I live in is big enough to have a hospital. Some country people have to travel hundreds of kilometres for treatment, or perhaps have to stay in a larger town for weeks if they have to have chemotherapy. Also, the councils of some smaller towns pay large amounts of money and provide housing to try and attract doctors to their area. It does sound very similar – and your distances are even bigger. I’m now asking myself to find out if in fact the French authorities are enticing young doctors in. There would be no problem with accomodation – it’s so cheap here! Also an early sign of community death. Thanks for provoking thought! A lovely selection, Cathy, both before and after the additions. Love the peachy-oranges! Many rural areas worldwide are similar food and medical deserts. Economics are tough. My spouse and I don’t live in such, but the interior and mountainous regions here in the US, are having a rough time. There needs to be more government-sponsored clinics with visiting doctors that rotate service to meet the need. Yes, economics are tough. And it is difficult to live in a democracy … but better. I am so hopeful that a way forward can be found. Gorgeous arrangement and I love your header picture. Very interesting about medical care and dwindling population in the counrtyside. I often dream of moving far from the madding crowd of the city. Think twice before you do it – although it is just right if you are in your ‘philosophising’ time of life! Love the colors and Dahlias and Roses are Garden Dreaming here in South Florida. Interesting about your healthcare situation. It is similar where I live, difficult to find a good doctor. The French system sounds wonderful compared what we have in the US. Those who have lived with their parents in the countryside maybe will come back … It is to hope …. Such a lovely comment, Fred! I find it all terribly sad, but I still relish the children coming back, because they can really let loose and be happy here. And I hope/believe there is a future for rural France. Enjoy your English garden … which I will visit again soon. You are spot on, Cathy. This is what I’ve observed in Britain. The area is so tiny. I think Americans will understand the difficulty of living in rural France better. But there are advantages as well – we really are a place apart, and actually I love that feeling of living ‘outside’. The Karma dahlias are wonderful. It is the first year Ihave grown them and hopefully there will be many more. Yes, it is sad Kris. I think you made a good choice, because perhaps you have the best of both worlds? Your friends should see ‘my sticks’ to understand what remote really is! Oh, more dahlias. Are they more popular this time of year because they are more abundant? They are here. I think of them as late summer and early autumn flowers. However, If I refer to them as such, I get corrected, and reminded that they start blooming in early summer. I really do not know. It seems to me that they are at their best as summer ends. Gorgeous arrangement, you have many of my favourite dahlias and roses. We are Francophiles and have often thought about moving to rural France, preferably somewhere with no English around, but for us I think it remains a dream. We would miss family and friends. But what excellent health care they have. A shame that people are moving away from rural France but the French seem to prefer city life. Hello Chloris, and many thanks for the comment. I don’t think the French prefer city life. It’s just that they understand that you have to earn money in order to live, and the cities are the only places where there are jobs. It’s incredibly expensive to be self-employed in France, so that’s an option ruled out for many. I hope Macron reforms some of the laws that punish self-employed people. This ‘punishment’ seems to be starting in Britain as well – although when I lived there it was a kinder economic climate for the person working on their own. Complicated subject! Once again, thanks for your comment.